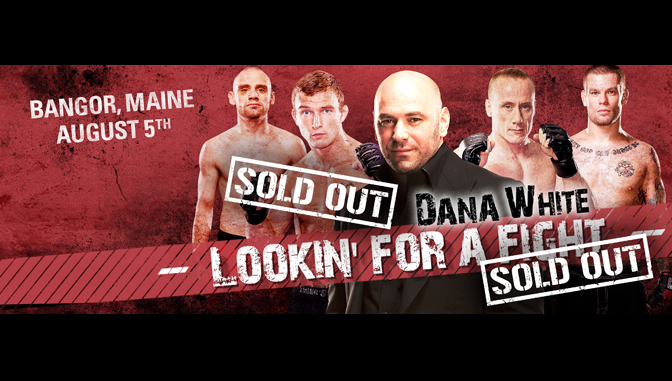 FOR IMMEDIATE RELEASE: Bangor, Maine (August 6, 2016) – New England Fights (NEF) held its most recent event, “NEF Presents Dana White: Lookin’ for a Fight,” Friday night at the Cross Insurance Center in Bangor. The event sold out moments before doors opened to the public. Over 1200 fans in attendance witnessed a wild night of eight professional bouts. The crowd included UFC President Dana White who was in attendance to film a future episode of his web series. Fight of the night went to Aaron Lacey (2-0) and John Santos (3-4). The two featherweights battled back and forth for a grueling, and bloody, 15-minutes. Lacey was declared the winner by split decision on the judges’ scorecards. In a rematch from 2014, NEF MMA Professional Lightweight Champion Devin Powell (8-1) took on Jon Lemke (5-6) in a non-title catchweight contest. In a repeat of the first bout, Powell scored the win over Lemke with a first round submission. Ryan Sanders (11-8) and Derrick Kennington (11-8) were the third fight of the evening to go the distance with Sanders picking up the victory via unanimous decision. In the bantamweight main event, Brazilian prospect Ricardo Lucas Ramos (9-1) submitted Glendale, California’s Alfred Khashakyan (7-3) in the second round.